The Smithsonian National Air and Space Museum as seen at night from the National Mall in Washington, D.C. The Smithsonian's National Air and Space Museum will celebrate its 40th anniversary by premiering a newly-redesigned gallery and staying open as the stars fill the sky above. The flagship building for showcasing aerospace artifactsin the National Collection opened July 1, 1976. Four decades later, the Washington, DC museum will mark the occasion by hosting an evening ceremony and, for the first time in its history, remain open all night long. "Wonder what it would be like to explore a museum in the middle of the night? Here's your chance to find out. While the artifacts don't literally come to life once the Sun goes down, 'All Night at the Museum' [will] present a new way to enjoy our collection," the institution wrote on its website. The renovated Milestones of Flight presents a new layout for some of its original displays, including the Friendship 7 Mercury capsule that John Glenn flew in 1962 and Gemini 4 spacecraft that supported the first American spacewalk. It also incorporates new exhibits, including an Apollo Lunar Moduleand the filming model for Star Trek's Enterprise. 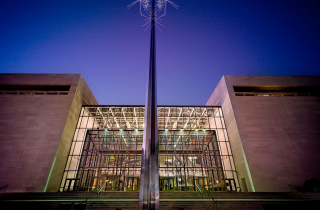 Before the opening of the redesigned gallery, the National Air and Space Museum will host an evening ceremony at its entrance on the National Mall, mirroring the museum's opening in 1976. The ceremony will include music by the U.S. Air Force Band and feature remarks and greetings by aviation and space heroes, as well as other friends of the museum. Visitors will then be invited to explore the new features of the Milestones Hall and the entire museum. Some of the night's special activities will include a film festival featuring aviation and space films, with introductions providing their cultural context. The evening will also offer tours of Milestones Hall, demonstrations by museum staff, music by the Air Force Band and special treat giveaways. A ticketed 21-and-over reception will be held with special guests, cocktails and the chance to mingle throughout the galleries. Tickets will go on sale at the end of May. Those who cannot attend will be able to tune in to the live webcasts with museum staff and guests on the museum's website. "All Night at the Museum" will begin at 8 p.m. EDT on July 1 and continue through 8 a.m. the next day (0000 to 1200 GMT). Early morning hands-on activities are planned for those with families. For the past 40 years, the National Air and Space Museum has presented and preserved the artifacts from the United States' aviation and space exploration accomplishments. Once considered the world's most popular museum, more than 320 million visitors have walked through its doors to see the aircraft and spacecraft that opened the skies and outer space to human flight. See artist’s renderings of the redesigned Boeing Milestones of Flight Hallat collectSPACE. Follow collectSPACE.comon Facebook and on Twitter at @collectSPACE. Copyright 2016 collectSPACE.com. All rights reserved.